Single-use tickets are available for $18.00/adult (age 12+) & $13.00/kids (age 2-11). On-line tickets (incl. tax) from the museum are normally cost $32.73/adults & $24.20/kids. Children under 2 are admitted free with an adult. Single-use tickets are available at the cost of $13.00 each. Admits: 2 Adults and all children under age 17. NOTE: There is an hourly parking charge. Admits: 2 adults and all children under age 18.
or go to tickets.crayolaexperience.com and use the store code: SPFL for the same discount. Admits: 2 persons age 10 and up. The Frick does not allow children under the age of 10 in the museum. Also covers: 10% discount on museum shop purchases. purchases in the Museum Shop. additional guests. Children under 12 are always free. Admits: 4 people of any age. Admits: Up to 6 people to the Intrepid Museum and the Submarine USS Growler. and now INCLUDES admission to the Space Shuttle Pavilion. you MUST also be prepared to show your library card. Liberty Science Museum for a $3 discount! Each family member must have their own library card in hand to receive the discount. Admits: 5 people, and allows the purchase of 3 additional admissions at $5 each. Children 16 and under are free at all times. Admits: 2 adults and 4 children. Also covers: 10% discount at the museum store and cafe. Admits: 2 adults + all children through age 17. Also covers: 15% discount at the museum store. Admits: 2 adults and all children under 18. Also covers: 10% discount at the museum shop and cafe. 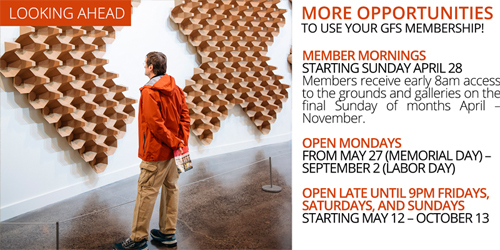 Also covers: 10% discount at museum store; access to Member Mornings. Please note: The museum is in a former subway station, so look for the marked subway staircase at sidewalk level. No onsite parking; street and garage parking in the vicinity. Single-use tickets are available at the cost of $10.00/per adult or child (age 2+). Buy your tickets ahead and skip the lines at this popular destination. 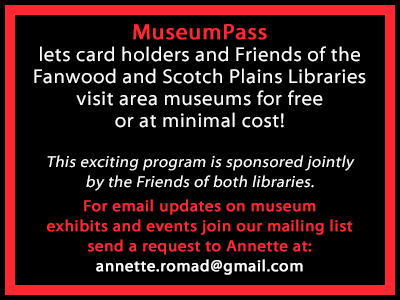 MuseumPass is a popular program sponsored jointly by the Friends of the Fanwood Memorial and Scotch Plains Public Libraries that lets card holders and Friends of both Libraries visit area museums for free or at a minimal cost! Scotch Plains and Fanwood Library adult cardholders, and members of the Friends of either Library who have a MURAL or a Courtesy Card. Cardholders must be in good standing. MURAL and Courtesy cardholders who are not members of the Friends are not eligible. Yes, there are several. Only one museum pass can be checked out per household. Once a museum pass has been checked out for a particular museum the household members must wait three months before taking out that same pass. These rules help everybody get a chance to visit the museums. Please read the additional rules posted further down the page. Every museum has different rules about its pass. Please check the guidelines for each specific pass. Museum passes are available on a first-come/first-served basis. You cannot reserve a pass. Passes may be checked out and returned only at the Scotch Plains Public Library. Passes MUST BE RETURNED IN PERSON at the circulation desk, NOT in the book drop! Absolutely nothing, unless you are purchasing discounted tickets. However, late and lost fees apply. What if I don't return a pass on time? Failure to return the pass will result in a fine of $10.00 per day (with a maximum fine of $200.00). Failure to return the pass container will result in a fine of $5.00. Patrons will be charged $25 for a new museum pass in the event it is lost, unless otherwise specified in museum descriptions above. Which museum passes are available? Please see the list at the top of the page - and of course we welcome your suggestions! Do all the passes work the same way? Each museum has different guidelines for its pass. Please respect the guidelines. It is up to the patron to check the museum hours and closures due to special events. Who pays for the museum pass? MuseumPass is made possible by the generous joint support of the Friends of the Fanwood Memorial Library and the Scotch Plains Public Library. Both Libraries' Friends groups are contributors and volunteers who are committed to supporting the health and well being of their local libraries. They work to foster interest in the libraries, make the public aware of the libraries' services and needs, and help the libraries provide special programs for individuals or groups in the community. The Friends also support the libraries with funds for the purchase of equipment, programs, and materials. If you are interested in becoming a Friend, membership forms are available at the front desk of each library. * Patrons must be in good standing with the library (no outstanding fines or fees). * Passes are offered on a first-come/first-served basis. * One museum pass is allowed per household. * A family may take out a pass to each museum one time in a 3 month period. * Passes may be kept for three days. * Patrons are asked to return the passes as soon as possible after they are used. * Passes MUST be returned in person at the Scotch Plains Library circulation desk, NOT in the drop box. * Failure to return the pass will result in a fine of $10.00 per day (with a maximum fine of $200.00). * Failure to return the pass container will result in a fine of $5.00. or the entire cost of the replacement, as specified in the museum listing above. * Each museum has its own rules concerning their pass. Please read all guidelines carefully.